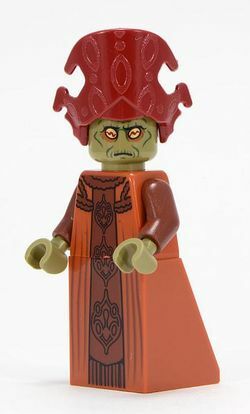 Nute Gunray is a Star Wars minifigure introduced 2009. Nute Gunray includes a dark grey headdress. His head is light grey with many black wrinkles, two orange eyes with a red line running through each, and a black frown. His torso is a red vest with a grey shirt with a symbol on it. He has orange arms and dark grey hands. His legs are a crimson red. He appears in three sets and is based on his features and looks from The Clone Wars. The Nute Gunray released in 2012 is modelled more after as he appears in the prequel trilogy of films. Instead of a piece for his legs, he has a sloped brick that is used to represent his robes. His torso is an orange colour with brown printing of frills and elaborate designs running down his front. These designs are continued down to the hem of his robes. The back printing of the torso continues the frill designs. His arms are dark brown and his hands are olive green. Gunray's head is the same shade of green and has yellow eyes with horizontal squiggles as his pupils. His headdress is taller than his head and is dark red. It has a large crest in the front, with a smaller knob on each side of it. It is not printed, but has 3-dimensional designs on the front. Nute Gunray was the Neimoidian Viceroy of the Trade Federation and one of the leading members of the Separatist movement. Though he stopped the shipping of supplies to Naboo and caused chaos, he was later captured by Padmé Amidala and Captain Panaka. Afterwards, he vowed revenge, and decided to join the CIS. He had watched the near-death of Padmé, Anakin Skywalker, and Obi-Wan Kenobi. But after they were rescued and the Clone Wars began, he fled. He was re-captured by Padmé after her second capture on Rodia. However, he was freed by Asajj Ventress and was protected afterwards. Gunray was killed on Mustafar, along with several other leading members of the CIS by Darth Vader after his fall to the dark side and his order to "take care of the Separatists". This page was last edited on 9 January 2016, at 23:10.